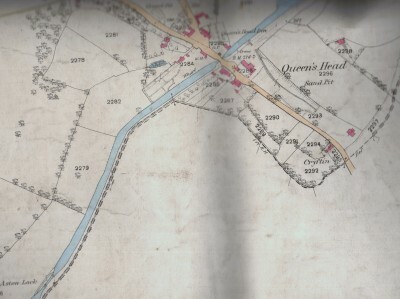 1875 map showing Queens Head wharf with a tramway leading down from the sand pit and going under the Rednal Road and onto the wharf. It can be seen that there was another wharf on the opposite side of the canal on the west side of the bridge. 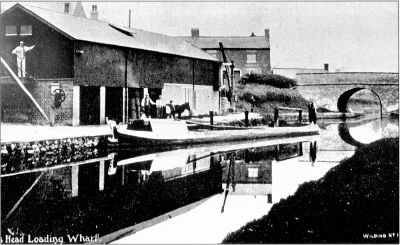 Early photo of a canal barge being loaded at Queens Head Wharf probably with sand from a sand pit in the field on the far side of the Rednal Road.It has recently been discovered that a tramway led from the sand pit down and under the Rednal Road, the tubs of sand being pulled by donkeys. This tramway is believed to have been built by 1880 and was still in use well into the 20th Century, the sand being taken by canal barge to Maesbury. 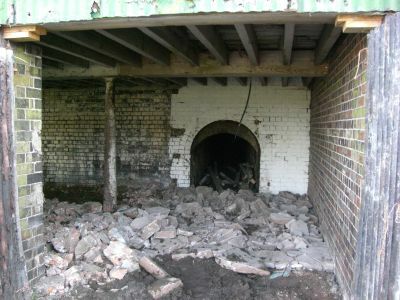 A brick lined tunnel has been found which led into the building and led to the side of the wharf. See next photo of the tunnel. 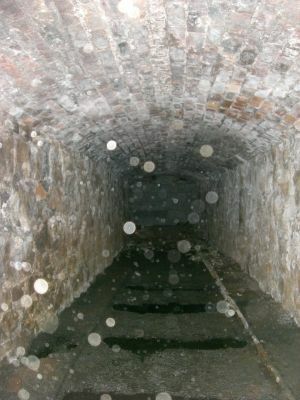 Looking inside the tunnel with the rails and sleepers still in the ground. 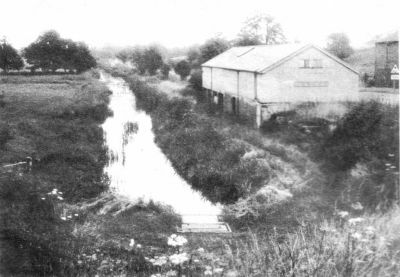 It would appear that the width of the track was fairly wide, possibly 4 feet..
Photo of the wharf prior to the restoration of the canal.